The histories of BSA Troop 95, the SGF Club, and SGF Vacation Camp are inexorably intertwined. Our brother Herman Tannenbaum uses an even better "i" word to describe that relationship. Herman's father Martin Tannenbaum was a president of the SGF Club, and both Herman and his brother Charles were Eagle Scouts in Troop 95. 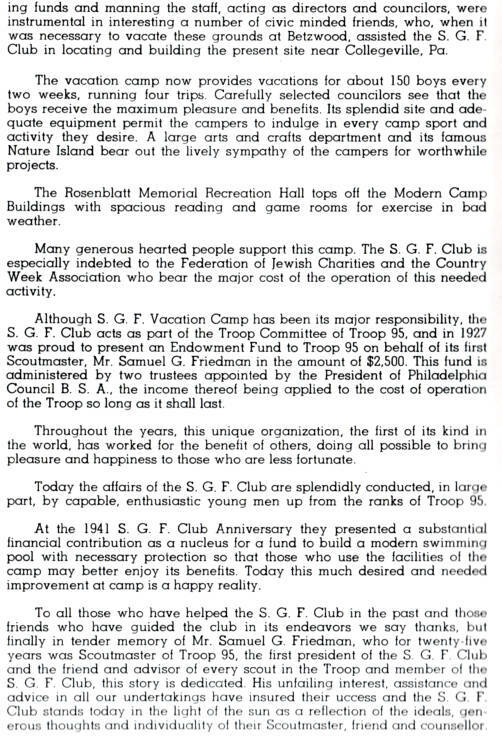 We thank Herman for generously sharing many Troop 95 anniversary programs from which we extracted both pictures and information about SGFVC. The pin at right belonged to Uncle Shorty's father, Martin Steiger, who also belonged to Troop 95 and was later a member of the SGFVC Board. BSA Troop 95 was established in 1912 under the leadership of first Scoutmaster Samuel G. "Pop" Friedman (pictured right). This was pretty pioneering stuff, since the Boy Scouts of America had been founded just two years earlier. 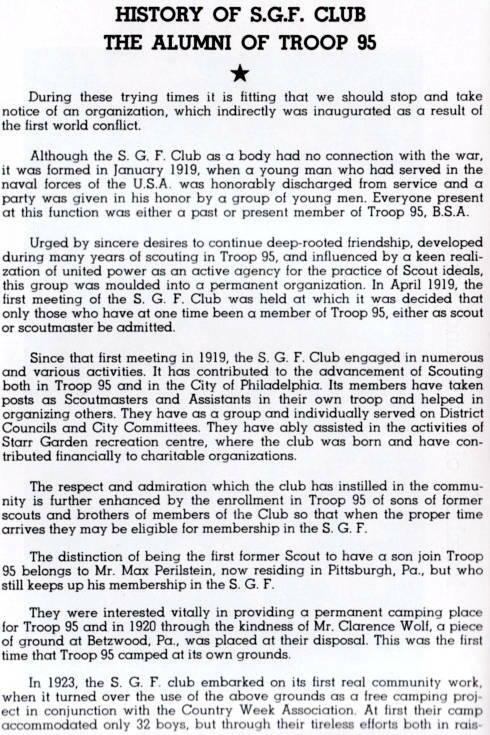 The SGF Club, consisting of past and current Troop 95 scouts and scoutmasters, was founded in 1919. 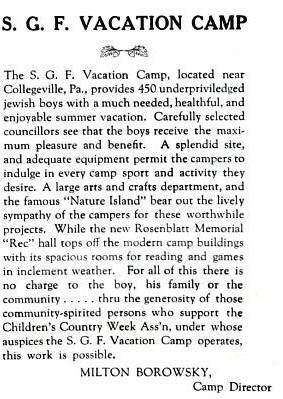 The SGF Club established SGF Vacation Camp in 1922 to provide a much needed healthful and enjoyable summer vacation experience to "underprivileged Jewish boys." The camp served as many as 520 boys each summer until its 1978 closing. In 2005, thanks to former campers who still harbored the SGF spirit, our camp has been reborn. SAMUEL G.FRIEDMAN - Philadelphia Insurance Man, 64, Boy Scout Leader, Dies - January 19, 1947, Sunday. (1882-1947). He was only 20 when he founded Troop 95. This history was scanned from the 1941 SGF Club program book. Betcha didn't know that SGF was an Internet pioneer when the rest of the world was still spinning Hula Hoops. Long before the advent of the popular Internet, SGF was the first overnight camp for underprivilged Jewish kids to have a website. 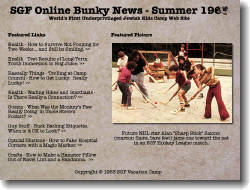 Our site was programmed by the SGF Bunky News staff under the guidance of computer guru Uncle Steve Funt during four two-week encampments. Campers created the site on punch cards which ran on a University of Pennsylvania Univac mainframe. Only 37 university and government computers were even able to view our website, but here is proof - the sole remaining picture of our camp's pioneering technical prowess. No wonder so many SGF-ers went on to greatness. We thank the anonymous SGF brother and the University of Texas Computer Center for providing this historical photograph.